Win Without Competing! 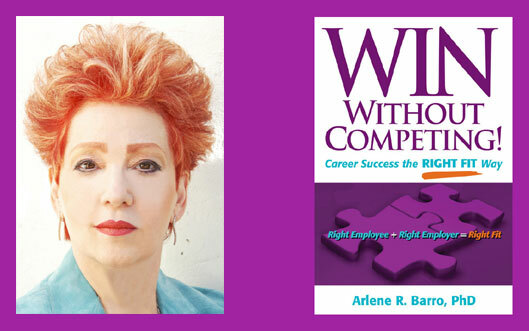 - Barro Global Search, Inc.
Career coach and author Arlene Barro Ph.D. �71 has made a career out of setting a high standard and making lasting impressions. 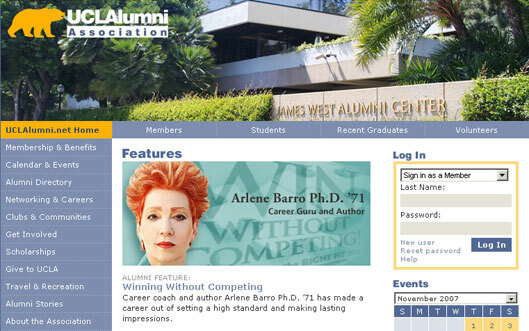 Arlene Barro Ph.D. ’71 has made a career out of setting a high standard and making lasting impressions. This extends even to her arresting physical appearance, complete with vivid red-orange hair. She describes her coif and its color as a way to differentiate herself. Those are useful qualities in her line of work. Barro is the founder, president and CEO of barro global search, inc. Her company biography describes a woman who wears many hats, including those of an educator, an educational psychologist, an evaluator, an entrepreneur, a search consultant and a career coach. Among her qualifications is her pioneering work in physician-performance measurement, conducted for the Association of American Medical Colleges. As a consultant, she has served the Israeli Medical Association, the Fox Chase Cancer Center, the New York Academy of Family Physicians and many other institutions. Additionally, Barro is responsible for creating the Anti-Cancer Audiobook Series for the public, which has been recommended by the American Library Association. She also founded Barro Health Communications, a company specializing in cancer-prevention programs. Currently, she is promoting her new book WIN Without Competing! Career Success the Right Fit Way. Barro earned her doctorate in education with distinction, with an emphasis in the gifted. For her dissertation, she studied creativity in screenwriters, an idea she credits to her English studies. She focused on two different approaches to identify creative ability in graduate students of the UCLA theater arts department; one of these approaches focused on divergent and convergent thinking. “Divergent thinking is brainstorming, analysis,” she explains. “A good example is, ‘How many uses are there for a paper clip?’ Convergent thinking is synthesis, only one answer, as in the case of ‘What time is it?’” These types of questions are important, she says, as true creativity requires an exchange between the two methods of thinking. Barro explored these concepts while working on her dissertation at UCLA, which examined the creative process. Barro says she really began developing her method in 1995 while working with an executive search firm. She realized that she knew, “not a better way – the way” to success. Barro says the usual method of sending multiple candidates’ résumés to a particular company and letting an employer decide was not as efficient as if she were to simply ask employers what they were seeking. Then, she would hand-select one candidate who fit the majority of the criteria. This process developed into the Right Fit Method, in which the search consultant creates a blueprint based on hours of talking with a prospective employer, finds a suitable candidate and “then, I package the person to pitch how he or she is the right fit for the job,” she says. The key to a good match, she says, is to select a person possessing at least 80% of the basic blueprint elements, and then “package to pitch.” This is done through strategic shaping of the résumé, coaching and enlightening the candidate as to how one manages the hiring process. Barro has had notable success with the major company WebMD, and the company’s founding editor-in-chief, Tom Lombardo, provided the foreword for her WIN Without Competing! She successfully matched 40 candidates in three countries for his company. He comments on the quality and the character of the hires she selected for his company, and attributes his company’s phenomenal success to his collaboration with Barro. Does her method of sending one candidate to a prospective employer always work? Most always, she assures her clients, but occasionally the chemistry just isn’t right. In order to effectively Win Without Competing (the capital letters are evident in Barro’s tone) one must enter a world that supports no assumptions, a world in which one must change his or her behavior quickly and learn to take charge. Barro offers the example of one candidate who, after not hearing back from a potential employer for six months, erroneously decided that the company didn’t want him. Predictably, but nonetheless powerfully, Barro proposes her method of avoiding competition to UCLA students and alumni. But does her method include being oblivious to potential competitors? 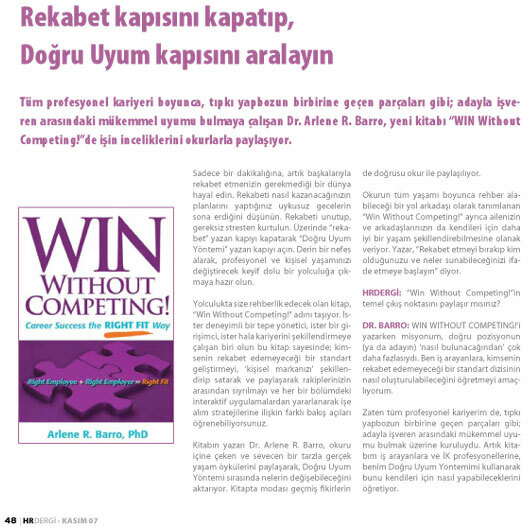 HRDERGİ: First of all, could you tell the basic premise of WIN Without Competing!? DR. BARRO: My mission for WIN Without Competing! was to write much more than a 'how to' find the right position (or candidate). My goal is to teach job-seekers how to set a standard against which no one else can compete," says Dr. Barro. "My sole professional concern has always been finding an exquisite fit between candidate and employer--like the interlocking pieces of a puzzle. Now my book teaches job-seekers and HR professionals how to use my Right Fit Method to do this for themselves. HRDERGİ: Your book teaches HR professionals how to use the Right Fit Method to make the perfect match themselves. Could you detail this method? DR. BARRO: Never begin a search unless you can create a blended blueprint of the Right Fit candidate. You must identify the specs of that candidate and weight the importance of each. If you take the time to define the Right Fit candidate, search for the candidate that matches the specs, and only hire the Right Fit candidate you will have a long-term employee. HRDERGİ: How does the Right Fit Method work? HRDERGİ: Our readers are HR executives. As a nationally recognized search consultant and career coach who is an educator, educational psychologist, and evaluator, do you have some special advice for them regarding the hiring process?